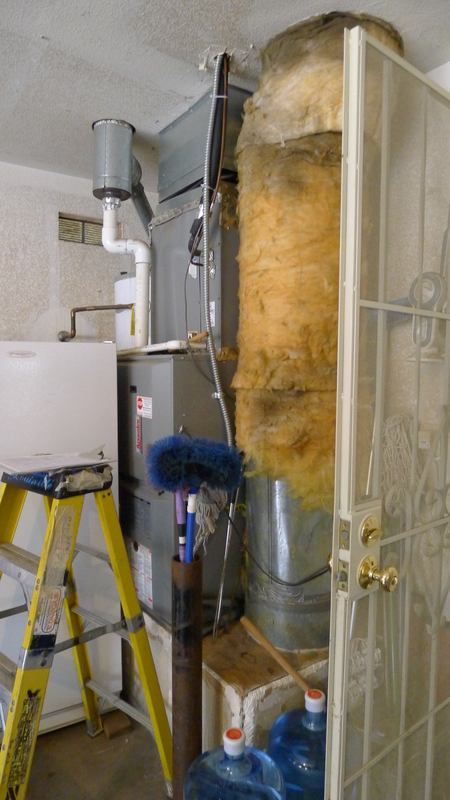 We’ve talked about the bad venting set up for this furnace and water heater and also about what it sits on in past posts. I’m not quite done with indoor air quality, and I’d like to draw your attention to another area of the duct work that is right out in the open. 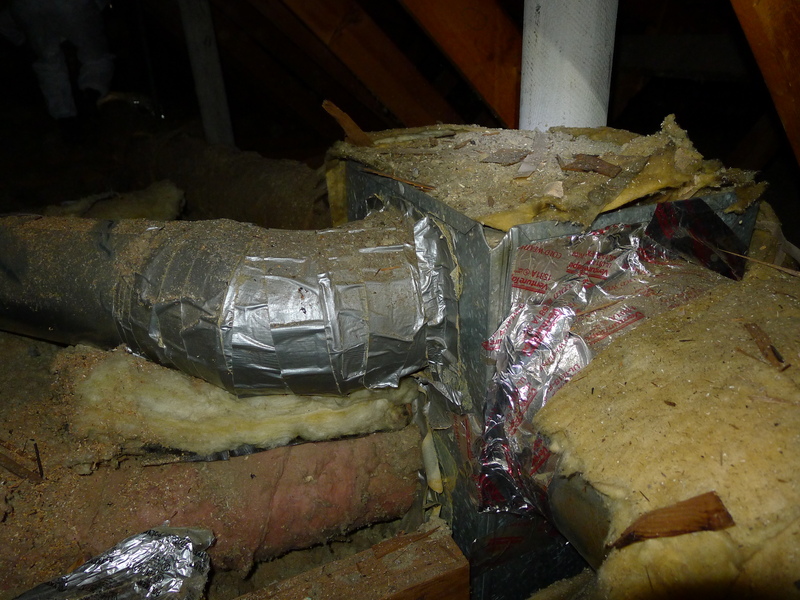 While we look at this system in the garage, you can see that there was an attempt to insulate and to seal the duct work. The un-faced fiberglass wrapped around most of the duct work is stained in a number of places. This would be from the garage air being drawn into the system every time it runs. The mystery regarding duct tape is why we call it that, since it doesn’t seal ducts and It was on parts of this system. Keep in mind that all of the observations were just from the garage, the area of the home you may walk through every day. Never mind what we found in the attic. The happy ending to this story is that this homeowner was given a list of solutions to the problems we found. With a new system, measures were taken in the home as well that will mean lower energy bills, better comfort, and most important of all a healthier and safer home. We spend much of our time indoors in this country. For those who suffer from Asthma this can be a problem especially when our indoor air can trigger attacks. I’ve been talking about Asthma Awareness this month, and I want to draw attention to some triggers in more detail. Improving a home with insulation and air sealing brings more than comfort and energy savings. It can reduce the amount of dust generated as well. Shutting down pathways to the outside can help reduce other pests and the influence of the outside as well. Sometimes the great outdoors isn’t so great for those of us who suffer from Asthma. Air sealing can reduce connections to other spaces as well, such as your garage where chemicals and fuels are kept. 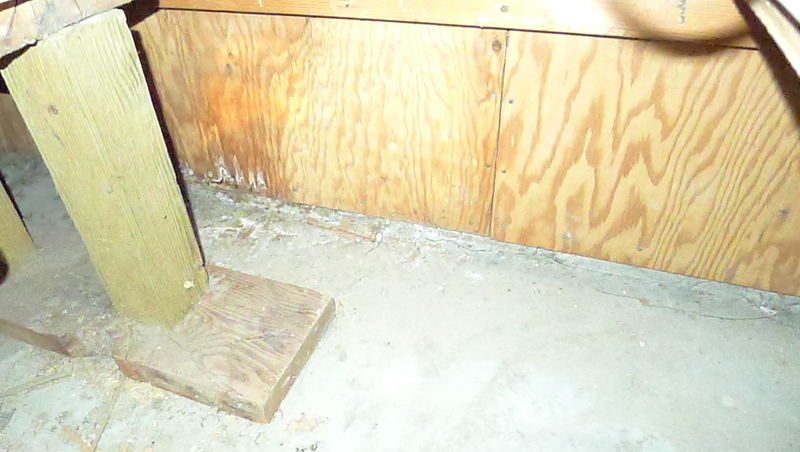 It can also reduce connections to crawlspaces and basements where things can get moldy. Consider an energy audit as a way to help increase the quality of your indoor air. Last week I showed you a venting system that wasn’t quite right, and mentioned the importance of having a certified technician review your HVAC and water heating systems. I wanted to cover a few more issues we discovered. An important part of heating and cooling air is getting it to and from the home. This is what duct work is all about. 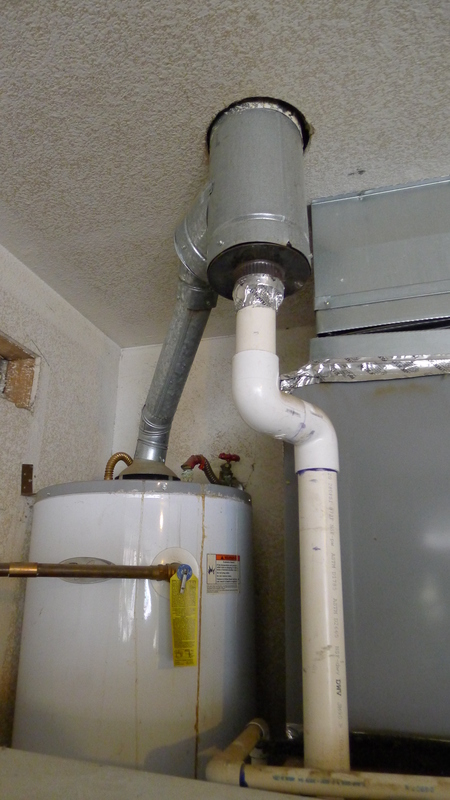 In this system’s case, the plenum, or box where the return air from the home comes back to the furnace, also acts as a platform for this furnace and water heater to sit on. Because it is where the furnace draws the air from the home, it is as you might imagine, connected to the inside of the house. And, as you can see in the second picture where the technician is looking into this plenum, there is a nice structural chunk of pressure treated wood, concrete floor and some moisture damage. Pressure treated wood probably isn’t the best thing to have in your duct system, nor is dry rotted plywood, and this plenum is very much a part of the duct system. It’s also not sealed. That means the garage is connected to the duct system and, therefore, to the home. Indoor air quality is important, and it should start with the air handling system. Stay tuned till next time! Retrofit For Health? Why Yes! Hard to breathe? 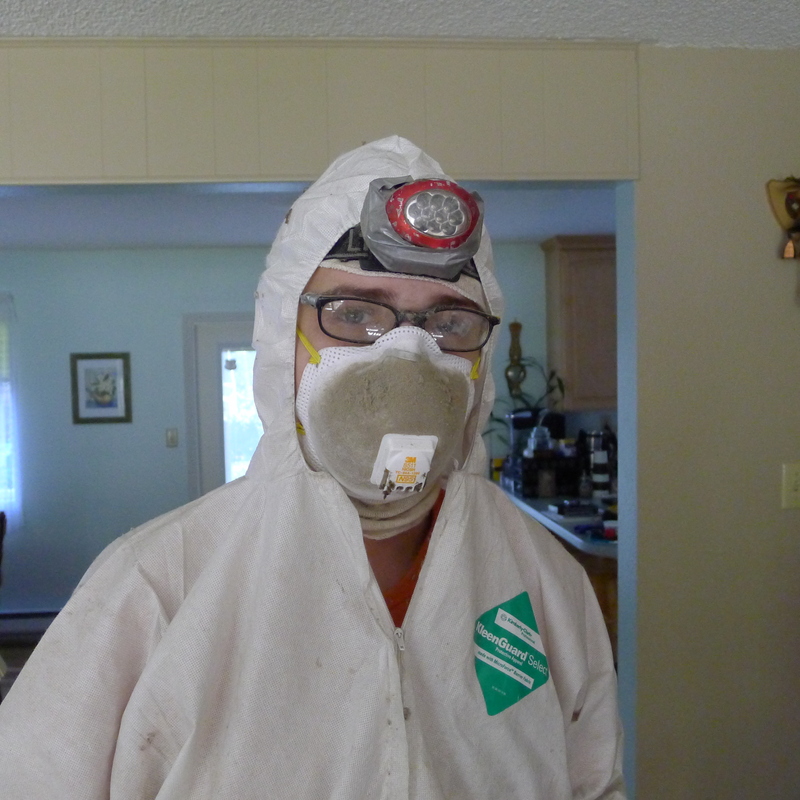 One of our advisors after working in an attic! Remodeling and home improvement is done for many reasons but health doesn’t usually come to mind first, but maybe it should. This is Asthma awareness month , indoor air quality and health seems a fitting subject. It may not be clear why some suffer from Asthma, but reducing triggers can sure help make it more manageable. It just so happens that some of those triggers are the same concerns we have in everyone’s home. Dust, mold, by products from combustion, and chemicals stored in the home can all cause problems. We’ve talked about it in the past and improving the indoor environment may help you keep the outdoors out since that can be a trigger too. Breathe easy in an efficient, safer and more comfortable home, your home. Click here for more information. While visiting one of our locations, Young’s Air conditioning in Los Banos, I had the pleasure of joining their auditor on the discovery of a unique furnace venting arrangement. As you might imagine with combustion equipment, unique is not really a good thing. To the untrained eye, this arrangement might look fine, everything’s connected after all. But even from a distance, this furnace and water heater set up, to even the slightly trained eye, looked wrong because…well it was. Two exhausts into one may be ok if it is sized right and pitched correctly, but here is a natural draft water heater and a power vented “sealed combustion” into the same flue. Power vented appliances are also called direct vent, implying they are directly vented to the outside, and should be, on their own. 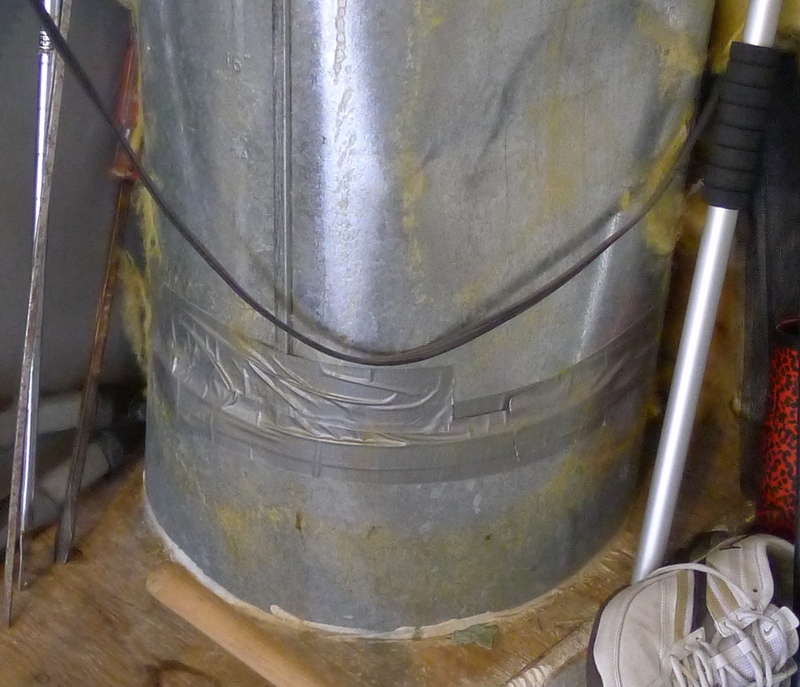 I ’m in awe over the connection where the PVC (used for lower temperature exhaust) is TAPED into the metal connector (high temperature exhaust) of the 6” flue. Making sure combustion equipment is set up properly is only the beginning. Having certified and trained people to install and assess that equipment is important. Our advisors are BPI-certified for this reason. I’ve got more to share, till next time. 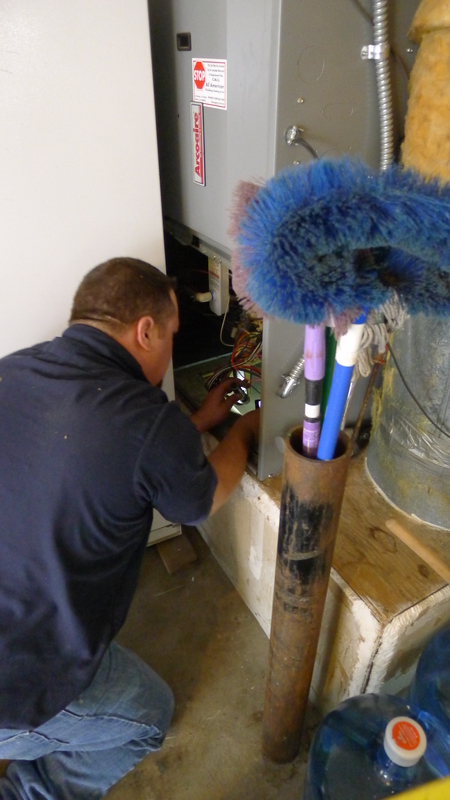 Are you Spring Cleaning and Considering your Ductwork? Ask why First! 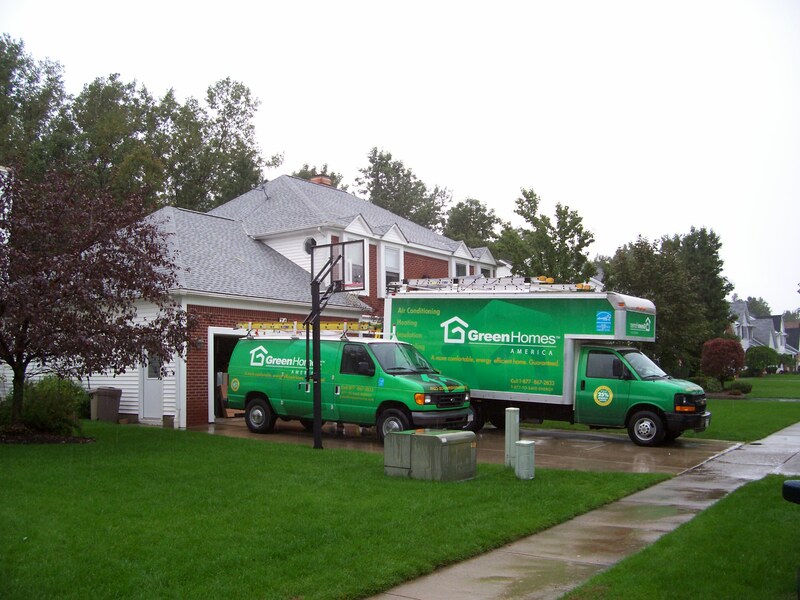 Having your ductwork cleaned can be a good thing. With the arrival of spring some of us throw open the windows and start cleaning everywhere, but it’s probably best to find a pro for ducts. They have the right equipment and training to do a thorough job. If you think the ductwork in your home needs a tune up, it pays to do a little homework first and ask why. Are they musty or dusty? Do they go through a crawlspace, basement or attic? Will you be fixing the problem or just a symptom? Duct cleaning is not a cure all, and in some cases, unsubstantiated claims are made from contractors taking advantage of our fears of mold and poor indoor air quality. Some unscrupulous contractors present pricing so high that for the same price you could get a new set of ducts installed instead! 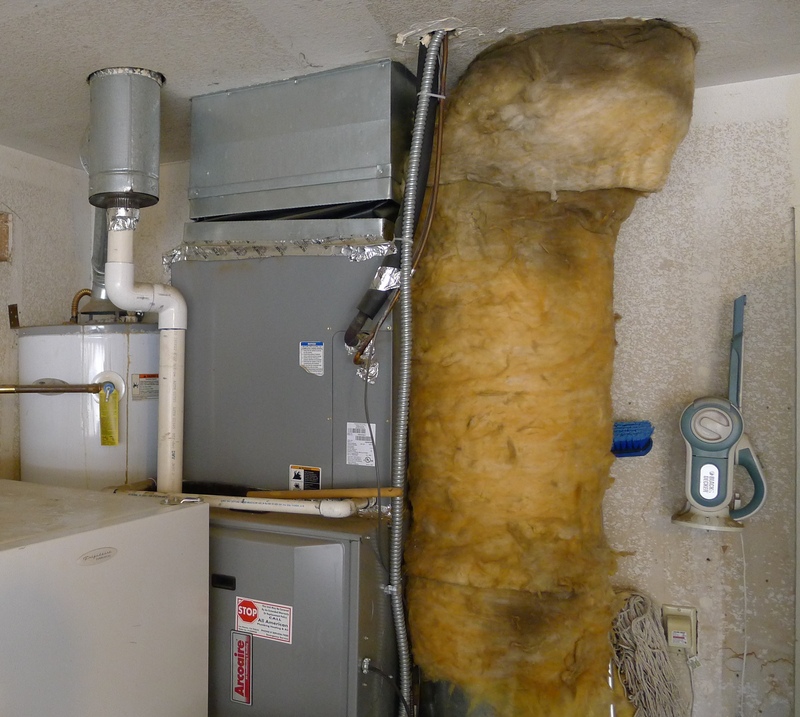 I’d suggest finding someone who understands that ductwork is part of a house as a system. In other words choose a home performance contractor to do the work, since cleaning ducts won’t help if they constantly pull dirty air from attics and crawlspace every time they run. That’s treating the symptom and not the problem. Take a look at what the EPA has to say and do it for the right reasons, and have them cleaned knowing you are doing the right thing! This time of year our homes are often closed up tight and we can get a little stir crazy by it. 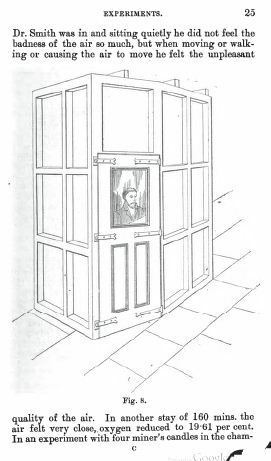 Dr. Smith, pictured in the print, subjected himself to this voluntarily, we find out in a text book on ventilation printed in 1891. His little home was made of lead and the window was there so he could break out if no one would let him out. A more trustworthy assistant would have been nice. The door was weather stripped with an India rubber tube. Funny how over 100 years later we still could use doors on our homes that work as well as his did! Well Dr. Smith discovered that fairly quickly the room got unpleasant and moist. He lasted for 100 minutes and then “three persons then went in and at once, pronounced the air to be very bad.” Not sure this counts as science, but it works for me. If it smells bad it is bad. Good enough. Ironically even today there are ongoing arguments about how much ventilation is needed but we need it. I’ve written about controlling the airways and it’s a good idea to have your ventilation strategies worked out too. Expert advice is only a call away. Don’t worry at GreenHomes America, we don’t use lead rooms and emergency glass. Not Just Cosmetics, Quiet, Comfortable, Energy Efficient and Clean Air Make a Home a True Thing of Beauty! GreenHomes America partner, ASI Hastings, demonstration home had a number of improvements to help show homeowners how their homes could improve and how they could save in the process. But cosmetics are the type of improvement we think of when we talk about home improvement. Make it look good, new coat of paint, maybe a new countertop. There’s much more that can be done and this demonstration home improvement list included: peace and quiet, comfort, and indoor air quality in addition to energy savings. There’s savings to be had outside too. 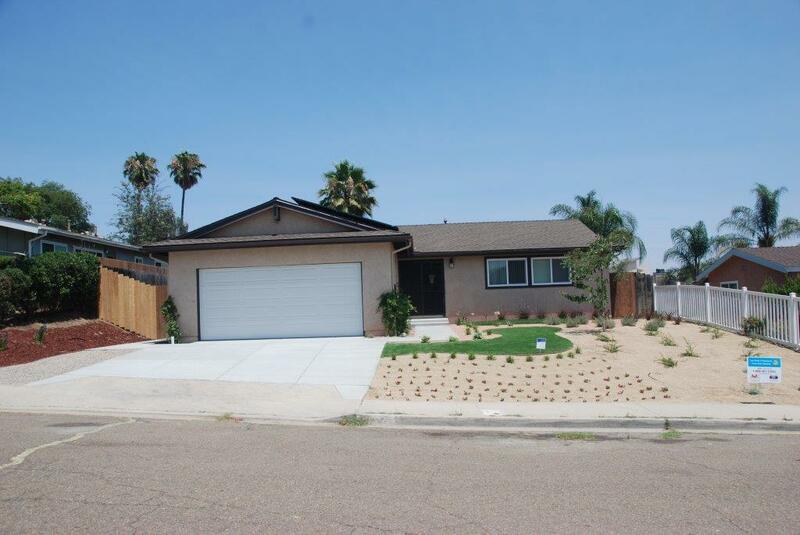 The team at ASI Hastings teamed up with Padre Dam, the local water district; they planted a less water intensive yard around the home. The front yard is referred to as xeriscape. Reducing water usage makes sense here! More money is spent pumping water in the state of California than for any other electrical usage. 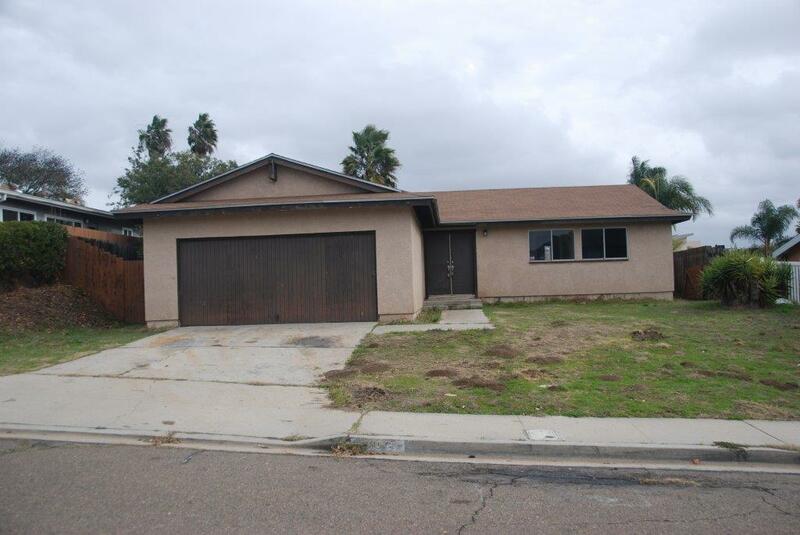 They also installed a lighter color garage door, which reduced some of the solar gain on that space. That keeps equipment in the garage cooler and the house as well since the garage buffers part of home from the heat outside. There’s no avoiding sunshine in San Diego, and it was put to good use in the as well adding panels to the roof, that’s not cosmetics, that’s great savings! We will cover solar, but more importantly what was done before it was even considered, in the coming weeks! Money, Good Health and a Comfortable Home, We Have Solutions! Why Get an Energy Audit? Watch this Video…. Summer is in full effect and with it comes the heat! The CDC has some great tips to help us get through this safely. Do not leave children or pets in cars. It’s no accident that air conditioning is at the top of the list. It is the number one line of defense against the heat. By all means get outside and enjoy the season, but make sure you have a safe place to retreat to when it gets too hot. Keeping the AC in your home in good working order is more than a matter of comfort, it’s about safety! Visit GreenHomes America for more info about making your home safer, more comfortable and energy-efficient. Stay current with the thoughts, tips, and trends affecting your home's performance.